Cardiac resynchronization therapy (CRT) is known to reduce all-cause mortality by 28% and new heart failure hospitalizations by 37% in patients with dilated cardiomyopathy (DCM). It proved to regress the left ventricle (LV) pathological remodeling, reduce the degree of mitral regurgitation if present, increase the left ventricle ejection fraction (LVEF), improve the patient’s clinical status, increase the quality of life and decrease heart failure hospitalization rate as well as the mortality (1). Implantation of triple chamber cardiac devices is a challenging intervention, first because of the difficulties that may arise in placing the lead in the coronary sinus (CS), and second because of the higher number of leads. These aspects prolong both the fluoroscopy and procedural time. Also, a number of three leads is an independent predictor for procedure related infectious complications (2). Th e large CRT trials to date widely used VDD or functional VDD pacing mode (DDD pacing mode with a lower rate of 40 beats per minute) 3 and atrial sensing seems to be at least as beneficial as atrial pacing in CRT patients (3,4). Some authors even reported an increase in atrial fibrillation burden with right atrial pacing because of atrial dyssynchrony and subsequent atrial enlargement (3). In the past few years, a new single-pass VDD defibrillator lead for dual-chamber defibrillators was analyzed and it seems to represent an attractive alternative to the insertion of two leads, regarding atrial electrogram recordings, pacing and defibrillation thresholds, and procedural and fluoroscopy time savings5. About 30% of the CRT patients lack a beneficial effect to this therapy (6). The etiology of the DCM is important for outcome- patients with idiopathic DCM seem to have a greater improvement in LV systolic function, reverse remodeling and survival benefit compared to ischemic DCM (7,8) mainly because of post myocardial infarction scaring (8,9). The response rate may be improved by optimization of the devices’ programmed parameters for each individual patient (10,11), and also by echocardiography-guided LVlead placement using the speckle tracking longitudinal strain technique (12). In patients with ischemic DCM with a LV aneurysm, aneurysm resection with LV reconstruction along with coronary artery bypass grafting (CABG) is considered an option by the Task Force on Myocardial Revascularization of the European Society of Cardiology (ESC) and the European Association for Cardio-Thoracic Surgery (EACT). Th e LV reconstruction addresses the post- myocardial infarction adverse remodeling by reducing the end-diastolic volume (scar/aneurysm removal), restoring the bullet-shape of the LV, reducing wall-stress and improving cardiac function (13). Some authors described it as a contraction resynchronization technique (14). We report the case of a patient with ischemic DCM, with a calcified LV aneurysm resection and LV reconstruction using Teflon strips, with significant persistent heart failure symptoms and severely impaired LV function, successfully treated by cardiac resynchronization therapy with defibrillator (CRT-D) using a single-pass VDD defibrillator lead. A 58-year-old man came to our clinic presenting fatigability and shortness of breath with low physical activity despite maximal medical therapy for heart failure. His history included an anterior myocardial infarction in 1992, a calcified LV apical aneurysm with a consequent ischemic DCM, three vessel coronary artery disease diagnosed in 2014 (75-90% distal stenosis of the left main coronary artery, left anterior descending obstruction with the aspect of a recanalized thrombus, 90-99% ostial stenosis of the circumflex artery and right coronary artery occlusion in the vertical segment) and a stage 3 essential arterial hypertension. He underwent open heart surgery, seven month ago, for aneurysm resection with LV geometrical reconstruction using linear suture on Teflon stripes, along with double CABG (autologous internal saphenous vein graft on the circumflex and posterior descending coronary artery). The electrocardiogram showed sinus rhythm and a left bundle branch block with QRS duration of 220 ms. Transthoracic echocardiography revealed a dilated LV (end-diastolic diameter of 7,6 cm, end-diastolic volume of 307 ml and end-systolic volume of 242 ml), interventricular and intraventricular dyssynchrony, global hypokinesia and apical akinesia (Figure 1A), with a low aortic velocity time-integral (VTI) (Figure 1B), a severely reduced LVEF (21%), and a grade II functional mitral regurgitation. Thus, the patient presented sinus rhythm, LVEF <35%, left bundle branch block, NYHA class III symptomatology15. Even if data is scarce about the response of patients with LV reconstruction, cardiac resynchronization therapy was the only reasonable choice at that moment and therefore he underwent implantation of a triple chamber implantable cardioverter defibrillator (ICD). A VDD ICD lead was introduced using the cephalic vein cut-off technique, to detect the right atrium (RA) and to pace and detect the right ventricle (RV). The CS lead was placed using subclavian vein puncture. This lead was placed in a lateral branch of the CS serving a viable segment of the LV (Figure 2). Frenic nerve stimulation required repositioning of the coronary sinus lead several times, resulting in a prolongation of the fluoroscopy time and total procedural time. Acute sensing and pacing thresholds were within normal limits- RA amplitude: 1mV, RV: 0,7V/12 mV, LV: 1V/7mV) as well as the pacing and shock impedances (RV lead: 504Ω, LV lead: 790Ω, shock impedance: 95Ω). Fifty minutes of a total procedural time of seventy were necessary for a proper positioning of the LV pacing lead, as well as twenty-four minutes fluoroscopy of a total of twenty-eight. Intraventricular dyssynchrony was still detected with LV and RV simultaneous pacing (LV-RV delay of 0 ms) and a sensed atrioventricular delay of 120 ms. Cardiac function improved but not to the best extent. 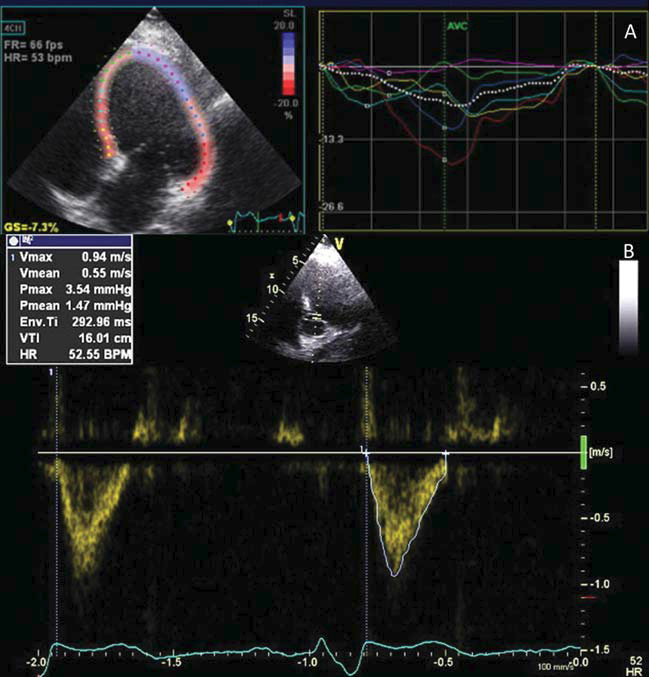 The contraction was optimized by setting a LV- RV delay of 20 ms, according to the highest aortic VTI measured by Doppler echocardiography. Figure 1. Before cardiac resynchronization therapy: A. intraventricular left ventricle dyssynchony, with global hypokinesia and apical akinesia (residual scar)-speckle tracking longitudinal strain, apical four chamber view; B. aortic VTI value of 16 cm – apical fi ve chambers view, pulsed wave Doppler. An improved and synchronous left ventricle contraction was achieved (Figure 3A). The LVEF rose from 21% to 32% with optimized CRT-D, and aortic VTI from 16 cm (stroke volume of 60 ml) (figure 1B) to 18.7cm (stroke volume of 80 ml) with simultaneous biventricular pacing and to 21.4 cm (stroke volume of 90ml) with sequential pacing (Figure 3B). The patient’s symptomatology ameliorated significantly (from NYHA class III to NYHA class II). Chronic thresholds and pacing and shock impedances were within normal values at one month follow-up, without inappropriate shock therapies. Several reports described LV reconstruction along with CABG to be effective and safe, with a favorable 5-year outcome, but lately this technique’s benefi ts are debated. The STICH trial data analysis showed that survival benefit was achieved only with values of postoperative end-systolic volume of less than 70 mL/m2, which was not the case of our patient (13). He needed aneurysm resection with LV reconstruction and CABG, but this was not enough in terms of alleviating heart failure symptomatology and improving systolic function. Adding cardiac resynchronization therapy had a very important role in improving the clinical status and LV contractility and it might have a role in improving the survival. It seems that prestimulating the LV by 20 ms has best counteracted the effects of the apical scar regarding electrical conduction fragmentation (16), resulting in an important improvement in LV function. It is very important to thoroughly investigate the residual scar that may have an unexpected shape secondary to the suture and/or inflammation, and to avoid placing the CS lead on it because of lack of excitability and conduction at this site (8,9). There is little data in the literature about the particular situation of combining the two therapies. Mizuno et al (17) reported biventricular pacing in a case of CABG with endoventricular circular patch plasty, with a good result. Also, Iino et al (18) reported biventricular pacing 18 month after partial left ventriculectomy and mitral valve repair, for recurrent symptoms of heart failure, with a favorable evolution. In both cases, the LV lead was placed on the epicardium. Da Costa et al recently reported procedural and fluoroscopy times for transvenous implantation of triple chamber devices for CRT of 66.3±39.5 minutes (30-150 minutes) and 20±22 minutes (3-85 minutes)19 respectively-significantly higher than with a simple device. Figure 2. 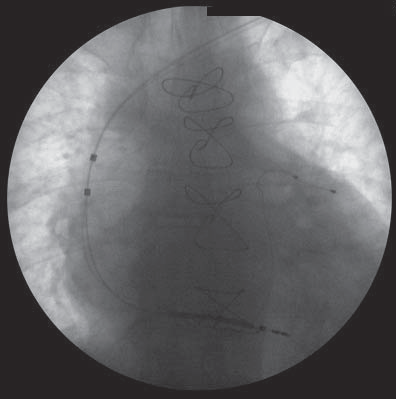 Triple chamber ICD with VDD defibrillator lead- fluoroscopy image, posterior-anterior view. Difficult procedures required 85 minutes procedural time or even more. Also, Heist et al reported a mean fluoroscopy time of 22.2± 18 minutes (28±9 minutes in case of LV lead repositioning for diaphragmatic stimulation) based on data from the LAND-IT trial20. These times were prolonged also in our case because of the problems determined by efficiently placing the coronary sinus lead. Some authors reported the use of VDD pacing leads for cardiac resynchronization therapy for patients without sinus node disease, decreasing the number of implanted leads and venous punctures21, but lacking the defibrillating function. The use of a single-pass VDD ICD lead placed in the right ventricle for CRT-D in a patient without sinus node disease, eliminating the need for an atrial lead, contributed to intervention and fluoroscopy time savings in our case and also ensures primary prevention of cardiac death. Figure 3. 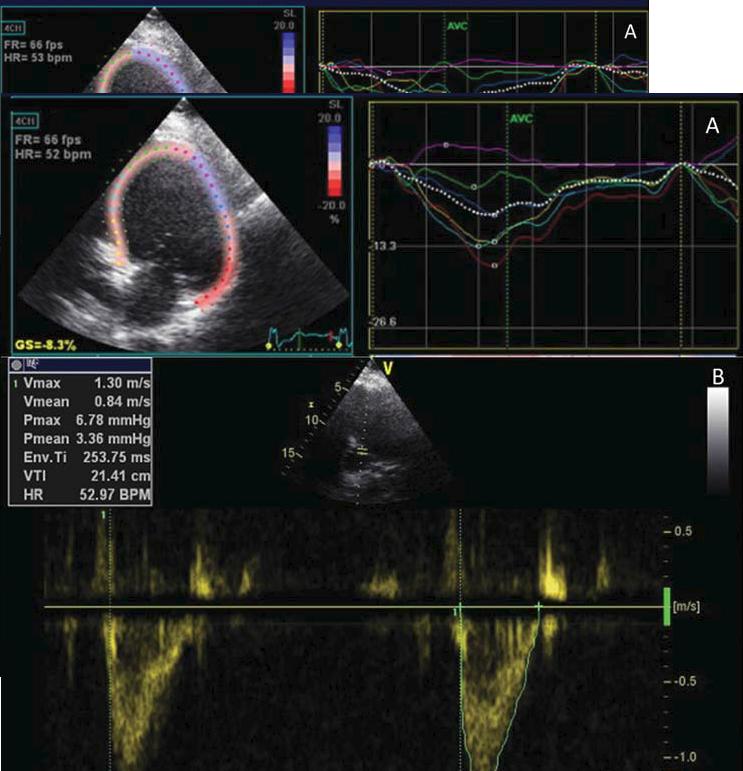 Left ventricle preexcitation by 20 ms: A. synchronous left ventricle contraction- speckle tracking longitudinal strain, apical four chamber view; B. aortic VTI value of 21.4 cm- apical five chambers view, pulsed wave Doppler. Atrio-biventricular resynchronization was successfully achieved, with the advantage of a lower complication risk specific for two lead devices and with a theoretically good defibrillating function (no arrhythmia to treat during the short follow-up period). The literature lacks data regarding the use of these leads for CRT-D.
Our case presentation sustains the fact that CRT has a beneficial effect after LV reconstruction on LV contractility and patient symptomatology. The idea of using the VDD ICD lead for CRT- D may be feasible and efficient in patients without a history of sinus node disease. Acknowledgement: This work was published under the frame of European Social Fund, Human Resources Development Operational Programme 2007-2013, project no. POSDRU/159/1.5/S/136893. 1. Ghio S, Freemantle M, Scelsi L, et al. Long term left ventricular reverse remodeling with cardiac resynchronization therapy: results from the CARE- HF trial. Eur Heart J, 2009;22:480-488. 2. Sohail MR, Uslan DZ, Khan AH, Freidman PA, Hayes DL, Wilson WR et al. Risk factor analysis of permanent pacemaker infection. Clin Infect Dis 2007;45:166-73. 3. Adelstein E, Saba S. Right Atrial Pacing and the Risk of Postimplant Atrial Fibrillation in Cardiac Resynchronization Therapy Recipients. American Heart Journal, 2008;155(1):94-99. 4. Martin DO, Day JD, Lai PY et al. Atrial support pacing in heart failure: Results from the multicenter PEGASUS CRT trial. J Cardiovasc Electrophysiol, 2012;23(12):1317-25. 5. Chicos AB, Knight BP. Using Floating Atrial Electrodes to Combat the Rising Tide of Inappropriate Defibrillator Therapies. Circ Arrhythm Electrophysiol, 2011;4:5-7. 6. Linde C, Ellenbogen K, McAlister FA. Cardiac resynchronization therapy (CRT): Clinical trials, guidelines, and target populations. Heart Rhythm, 2012;9:S3- S12. 7. McLeod CJ, Shen WK, Rea RF, Friedman PA, Hayes DL, Wokhlu A et al. Differential outcome of cardiac resynchronization therapy in ischemic cardiomyopathy and idiopathic dilated cardiomyopathy. Heart Rhythm, 2011;8(3):377-82. 8. Adelstein CE, Tanaka H, Soman P et al. Impact of scar burden by single-photon emission computed tomography myocardial perfusion imaging on patient outcomes following cardiac resynchronization therapy. Eur Heart J, 2011;32:93-103. 9. Chalil S, Foley PW, Muyhaldeen SA et al. Late gadolinium enhancement-cardiovascular magnetic resonance as a predictor of response to cardiac resynchronization therapy in patients with ischaemic cardiomyopathy. Europace, 2007;9(11):1031-7. 10. Kosmala W, Marwick TH. Meta-analysis of effects of optimization of cardiac resynchronization therapy on left ventricular function, exercise capacity, and quality of life in patients with heart failure. Am J Cardiol, 2014;113(6):988-94. 11. Bogaard MD, Meine M, Tuinenburg AE, Maskara B, Loh F et al. Cardiac resynchronization therapy beyond nominal settings: who needs individual programming of the atrioventricular and interventricular delay? Europace, 2012;14:1746-1753. 12. Daya HA, Alam MB, Adelstein E, Schwartzman D, Jain S et al. Echocardiography- guided left ventricular lead placement for cardiac resynchronization therapy in ischemic vs nonischemic cardiomyopathy patients. Heart Rhythm, 2014;11(4):614-9. 13. Castelvecchio S, Menicanti L. Left ventricular reconstruction: update to left ventricular aneurysm/reshaping techniques. Multimedia Manual of Cardiothoracic Surgery, 2013; doi:10.1093/mmcts/mmt002. 14. Castelvecchio S, Menicanti L, Di Donato M. Surgical Ventricular Restoration to Reverse Left Ventricular Remodeling. Current Cardiology Reviews, 2010;6:15-23. 15. Brignole M, Auricchio A, Baron-Esquivias G, et al. 2013 ESC Guidelines on cardiac pacing and cardiac resynchronization therapy. The Task Force on cardiac pacing and resynchronization therapy of the European Society of Cardiology (ESC). Developed in collaboration with the European Heart Rhythm Association (EHRA). Eur Heart J, 2013;34: 2281-2329. 16. Abozguia K, Leyva F. Targeting Viable Myocardium in Cardiac Resynchronization Th erapy Using a Multipolar Left Ventricular Lead. Circulation, 2011;123:e617-e618. 17. Mizuno T, Tanaka H, Makita S et al. Biventricular pacing with coronary bypass and Dor’s ventriculoplasty. Ann Thorac Surg, 2003; 75(3):998-9. 18. Iino K, Ohashi H, Tsutsumi Y, Kawai T, Fujii H. Biventricular Pacing 18 Months Aft er Batista Operation. Ann Th orac Surg, 2006;81:2302-4. 19. Da Costa A, Gate-Martinet A, Rouffi ange P et al. Anatomical factors involved in diffi cult cardiac resynchronization therapy procedure: a non-invasive study using dual-source 64-multi-slice computed tomography. Europace 2012;14:833-840. 20. Heist EK, Toluie K, Mazer S, Lee K. Factors aff ecting radiation exposure during CRT implantation: Results from the LAND-IT registry. J Am Coll Cardiol. 2012;59:E706. 21. D’Ivernois C, Pi S, Hero M. Cardiac resynchronization therapy using a VDD lead. Pacing Clin Electrophysiol, 2005;28(11):1240-2.